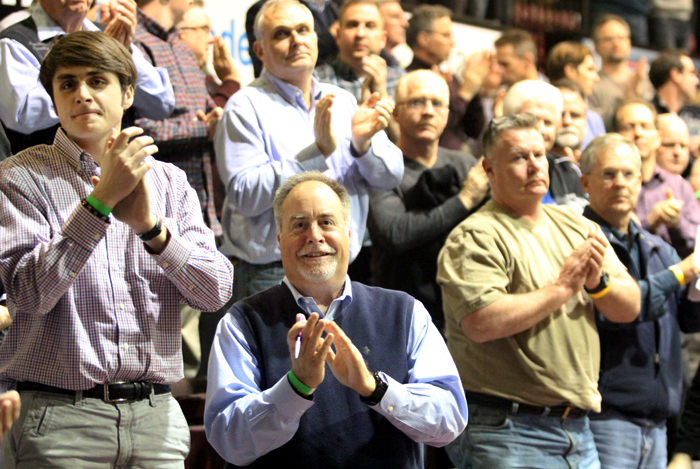 In Christian life, “All men – single and married, lay, religious and ordained – are called to lead,” Archbishop Charles Chaput wrote for a program note for the annual Man Up Philly conference held March 12 at St. Joseph’s University. In fact, the estimated 900 attendees heard from what was probably the most diverse group of speakers in the eight-year history of the conference. It culminated with the afternoon Mass celebrated by Bishop John McIntyre, who has attended all eight of the conferences. The first speaker out of the gate was Curtis Martin, founder and CEO of FOCUS, the Fellowship of Catholic University Students. “If you want to change the world, read sacred Scripture. The book of life is the Bible and it is the most important book there is,” he told his audience. Martin is a high energy, effective motivational speaker for the cause of Catholicism, and the proof of it is the growth of FOCUS from two college campuses 18 years ago to 110 today with plans to spread to Europe in the near future. But probably the most effective anecdote in his keynote address was very personal. He and his wife, Michaelann, are parents of nine children. When Michaelann was pregnant with their last child, they were informed the baby would probably have Down’s syndrome. They did not abort the baby, as so often happens today, and Michael was indeed born with Down’s. The baby, Michael who is now 2, in spite of his disability is the joy of his parents’ lives. “He’s a spectacular little guy,” Martin said. The next speaker, Father George Grima, is a Maltese priest who has dedicated his life mostly to orphans or abandoned children in Brazil, Kenya and Ethiopia. His ministry was greatly influenced by Blessed (soon to be Saint) Teresa of Calcutta. Through his words and a Power Point presentation, he showed a world where children are infected by AIDS through their parents, children have no milk because their mothers are starving and where they are simply left on the road to be eaten by hyenas, where they are infested with worms because of unclean water, and often there is no medicine to help them, and inevitably some die because treatment is too late. Father Grima explained one of the horrific but somewhat effective emergency methods sometimes used to rid the child of the worms which, if left alone will starve the little one to death by internally consuming his or her food. If no medicine is available, the child is suspended upside down over a bowl of milk for a half hour or so. The worms, sensing the milk, crawl out of the child’s mouth. 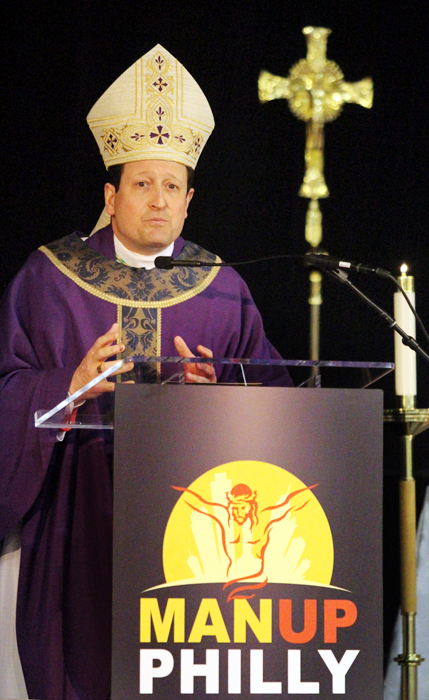 Father Stephen DeLacy, the director of the Vocations Office for the Diocesan Priesthood, used the opportunity with so many young men present in the gathering to promote the thought of discernment to the priesthood. He noted the numbers of priests are dwindling — just for replacement of retiring priests at least 15 newly ordained are needed every year — but in recent years the average number ordained has been five. As an encouraging sign, this year 20 candidates entered St. Charles Borromeo Seminary to study for the Archdiocese of Philadelphia and another six entered through the Neocatechumenal Way, also for Philadelphia. But seminary formation is a long process and a time of continued discernment. Generally speaking about 50 percent of those who entered in recent years discerned their vocation is as laymen. The goal really should be 30 new men every year to ordain 15 eventually, a not impossible figure considering the strides now being made, Father DeLacy suggested. He asked that all seminarians at the conference stand to be recognized, and several did. He also asked others who might consider the priesthood to stand and about two dozen others ranging from elementary school through young adult years stood, much to the applause of the gathering. Among the seminarians who spoke to the group was Max McGallagher, 26, who is in his first year at St. Charles. He was not born Catholic, but in a sense he is not a convert because his family had no religion to convert from, although they were good people. As a young boy, his main interests were playing sports and music, both of which he still enjoys. By the time he was 18, he began to see his friends who were not addicted seemed happy. He made the decision he would try to kick the drug habit, which was easier said than done. Over the next four years it was 12-step meetings and rehab followed by periods of remission, only to start up again, while meanwhile continuing his education. McGallagher remembers the exact date his life began to turn around. It was Nov. 12, 2012, at a 12-step meeting right after a drug binge. There was an older man who really was concerned for him and invited him to his house for further discussion. At his house the man talked about God, Catholicism and the 12 steps, but McGallagher wasn’t buying any of it. As McGallagher was asking to leave the man asked a startling question: “Would you mind if I pray for you?” McGallagher was shocked; no one had ever done that before. To make a long story short he left a changed man. He quit drugs completely, looked up his nearest Catholic parish where he took up instruction directly from a priest and was admitted to the church with full sacraments the following Easter. This year was his fourth Man Up Philly conference, and it was through Man Up and Malvern Retreat House that he made the decision to enter St. Charles Seminary and in God’s good time he intends to be ordained a priest. An afternoon speaker was Camden County, New Jersey, Chief of Police J. Scott Thomson. It is not an enviable task. Camden is the city of over 50,000 with the highest crime rate in America. Yet on his watch, this crime rate has been dramatically reduced although still high. For most of his career, especially in narcotics, he had an outstanding record with more arrests than anyone on the force. But he came to realize many of the people he was arresting were victims of their circumstances, especially poverty, and he knew in similar situation he would probably be the same. When Thomson was named chief after the state took over governance of Camden, he put in many reforms. More officers were put on street beat patrol and they were ordered not to necessarily arrest people who might be dealing drugs. Rather than trying to catch them in a sale, he encouraged the officers to go up and engage them, stand by them. No one is going to buy or sell drugs if a cop is standing there, he reasoned. When you get to know the people, “The extent of the spirituality and faith is the population is endless,” he said. The final speaker was a familiar one to many Philadelphians and this was his second appearance as a Man Up presenter. 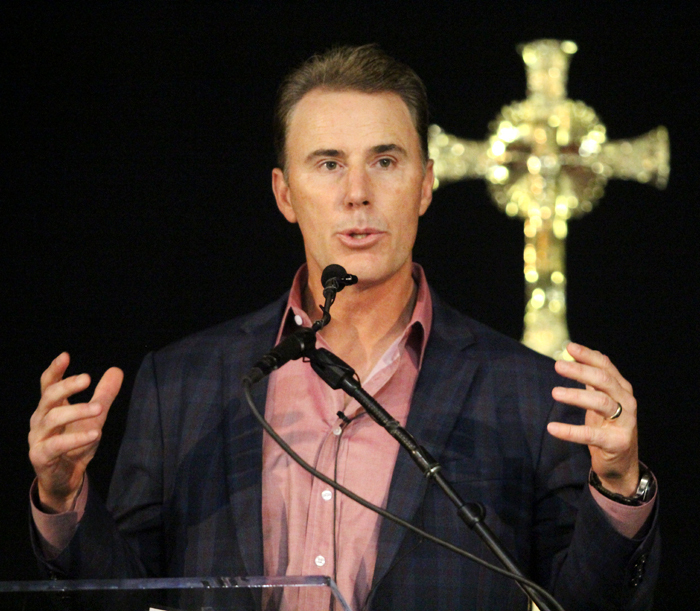 It was Philadelphia-born Rich Gannon, a former pro quarterback and league MVP (2002) who played in the NFL for 18 seasons and is now a CBS-TV and Sirius sports commentator. He has great memories from St. Cecilia School and the Immaculate Heart Sisters, but what stuck to him most was an inscription on a wall at the school, “The soul of education is the education of the soul.” It stayed with him so much that for his graduation from St. Joseph’s Prep, that was the motto he listed. After entering the NFL, the life change with instant wealth was almost overwhelming. He realized his Christian life was something he was born into, but had never made it a conscious choice. Clearly, the message sent by the variety of the speakers was not lost on those in attendance.